Conjunctival Malignant Melanoma (CMM) is a severe rare malignant tumor of the eye. CMM is commonly, presented as a pigmented lesion with dilated conjunctival feeding vessels . Figure 1. Pigmented nasal tumor with clear cysts. A 78-year-old man with bilateral cataract history presented for a pigmented nasal lesion of the left eye. Ophthalmic examination reveals a pigmented tumor with clear cysts and without any visible abnormal vessels (Figure 1). Figure 2. HEx250: conjunctival mucosa seat of a malignant tumor proliferation with diffuse pigmented atypical cells. A large conjunctival excision was performed with no touch technique completed by corneal epitheliectomy respecting the Bowmann and cryotherapy to conjunctival margins. Histological exam reveals a conjunctival melanoma (Figure 2, 3). Patient was referred to a medical oncologist, and the Tumor was staged as T2 N0 M0. Twenty months after excision, patient still has no evidence of distant or regional metastasis. The risk factors for CMM are not well understood. While known risk factors for cutaneous melanoma including family history are fair skin and hair, high density of freckles , UV light exposure especially during childhood [3, 4], and genetic syndromes such as familial melanoma syndromes , xeroderma pigmentosum, Hodgkin lymphoma and hereditary retinoblastoma , the risk factors for CMM are not yet established. Figure 3. 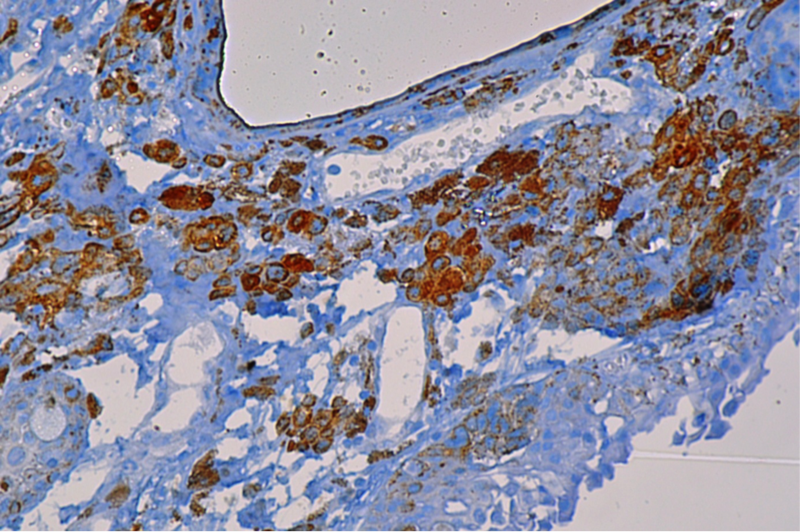 IHCx400: High and diffuse stain of HMB 45 by cytoplasm cells tumor. CMM can arise from a preexisting naevus, de novo, but is most commonly seen in the setting of primary acquired melanosis (PAM) . 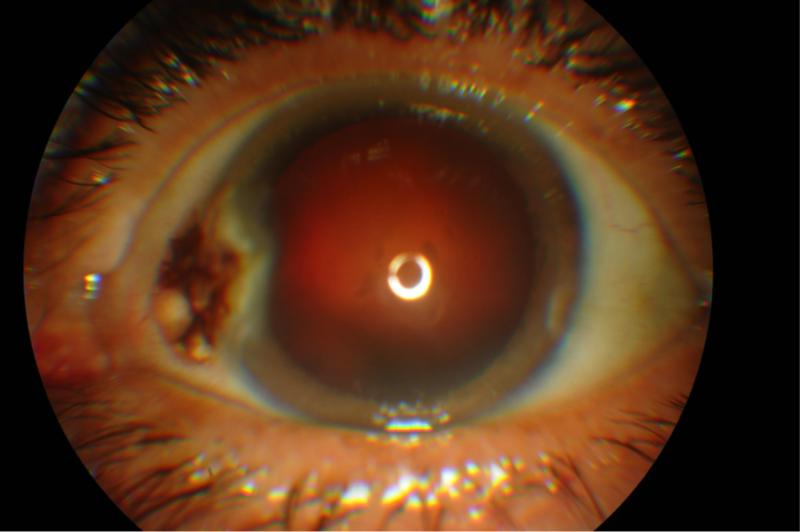 Most invasive conjunctival melanomas arise in the bulbar conjunctiva, especially temporally, less common sites of origin being the caruncle, plica and tarsal conjunctiva . 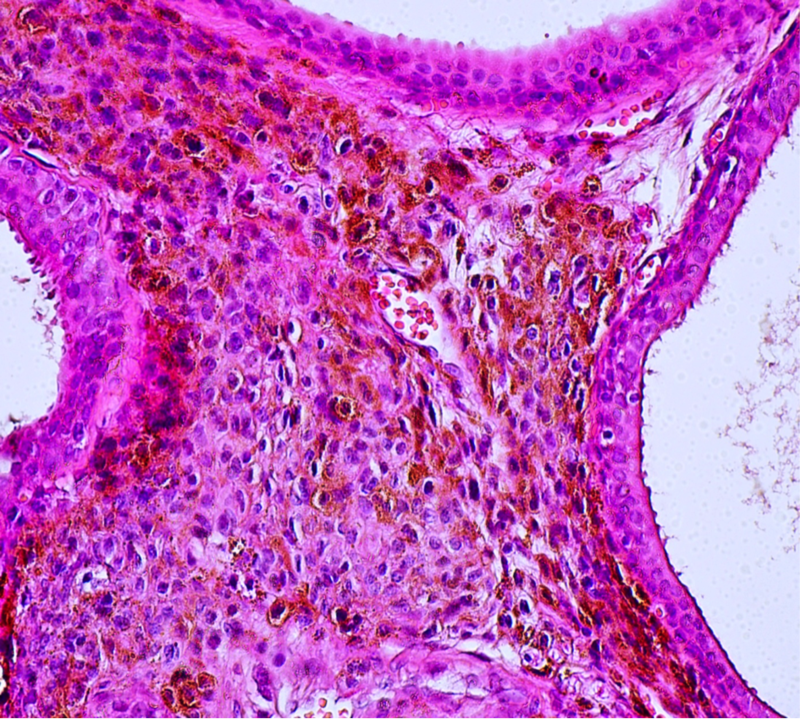 Histopathological and immunohistochemical study of excised pterygia showed that preneoplastic diseases such as PAM with atypia and nevi may coexist with pterygia . Cumulative genetic damage from chronic UV exposure was speculated to be a shared etiology between pterygia and preneoplastic diseases . The current standard of care is wide local excision, followed by cryotherapy to the margins. This is often followed by a variety of adjuvant therapies in order to prevent recurrence and metastasis .